ribbon or raffia, and fresh flowers. What you do: Teacher paints the palms of the children's hands. 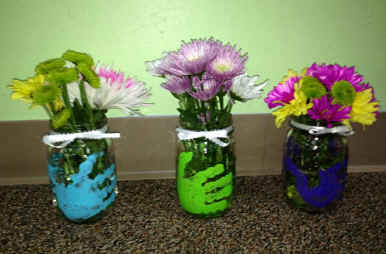 Children grab the mason jar with both hands on both sides of the jar, and immediately release their hands so as not to smear the paint. (For younger children, teacher guides and presses their hands to the sides of the jar.) Allow to dry. Tie ribbon or raffia around the mouth of the jar. Fill with water and fresh flowers. Give it to mom! You can also attach a poem to the jar or card that says, "Hands down, best mom!" From Miss Dana's two-year old class. If you find this idea useful to your ministry, then please help to support this website. Click here.